Good bye 2018, and for the most parts good riddance. Although not as horrid as 2015 ( my annus horribilis if you will) there are some parts of last year that I’m glad to be leaving behind us. That said it’s not been all bad- I’ve also learnt to ride the ups and downs and go with the flow more. We also made some great memories as a family, and things like this little blog have continued to grow which amazes and excites me all at the same time. Also we have made another year without having to use an epi pen on mini me. It came close ( cheers mr insect) but never the less a year without an anaphylactic shock is always a positive, especially as we’ve all had the epi- pen shortage issues as well, I was like a bloodhound at one point trying to track one down. Other positives are we had a great family holiday, fabulous days out and plenty of fun in the glorious summer heat wave. My little blog- this little blog that I started a few months after L’s first reaction, has grown, and continues to grow with followers which amazes and humbles me at the same time. Thank you to you all. This year I’d like to obviously carry one with my usual content of recipes, advice and the odd review but I’d like to share with you all a bit more about our lives, how we manage Type 1 diabetes, Coeliac disease and food allergies, a bit about what we all get up to, and why ( for my own sanity) I think I’m going to start a bullet journal. Well try to anyway. So there we go, thank you for sticking with me- now let’s see what 2019 has to offer. Well hello 2018. Whilst I’m not one for gushing posts I’d love to take the opportunity to wish all my friends, family, bloggers and followers a very Happy New Year. I’m humbled to think my follower numbers and view are increasing, something I hope continues throughout the new year. We now have dairy free to contend with, so you and expect more recipes and reviews etc to incorporate this. As always if I can offer any advice regarding allergies and diet then feel free to send me a message. You are never alone, there’s always someone who will listen. 2017 proved challenging for us in some places. Health wise family members have suffered. Mini me started school- this is a milestone for all parents, but navigating food allergies in the mix as well requires lots of planning. We now flexi- school ( expect more posts on this) this means part home education and part school. I’ll add allergies were not the reason for this decision, and so far it’s proving to be the right choice. We are looking forward to our new challenges in 2018 and ready to face it full on. All that’s left to say is I hope the hangovers recover soon, and bring it on 2018, we are ready for you. Well hello to you all and welcome to my first post of National Free From Week. This week you can expect a recipe ( or two). A review and maybe a competition- so keep your peepers peeled. Anyway I thought I’d start with sharing my favourite new products. It seems ( rather like autumn tv) that the run up to Christmas brings all things new and exciting and this includes those in the Free From world to. And yes, yes I know I’ve mentioned the C word but those of you with children will be hearing about it already- unless it’s just mine that is obsessed with all things festive? Actual Chocolate gateau, for £3 that’s dairy free and delicious to, really what’s not to love? I can hear the cheers and whoops all around from here. Whilst we are on the subject of Tesco I should add Schar have introduced actual waffles, no good for us due to Lupin flour in the ingredients but exciting none the less. There are also an Almond Bakewell, Fruit slice and Brownie from Mr Kipling on the shelves this week in your local store. Other highlights are a celebration cake kit from Delicious Alchemy and gluten free San Miguel ( yes really). In Sainsbury’s not only are they extending their Gary ( dairy free cheese) range, Christmas has also come early. Last year the Christmas pudding was my favourite and is gluten, nut and dairy free so naturally I might have purchased one- I’m not bonkers honest, they just sell very quickly. Lastly my favourite news is that Baileys have launched their Dairy free, gluten free version of the classic drink. I’m yet to find it, I believe that Wholefoods are stockists, but I cannot wait to give this a try. So there we have a brief round up of my new favourites. Have you spotted anything that tickles your tastebuds? Let me know in the comments below. You may or may not have wondered that I’ve been a smidgen quiet the past few weeks. I’ve not forgotten you. However a broken iPad and damaged internet connection has been the main culprit. Mini me has started school in reception, so getting care plans in place and helping with allergy training the staff have also taken time and a LOT of energy. We have also embarked upon flexi-schooling so 3 days at school and 2 days home education. For us, at the moment, this is working wonderfully, expect some blog posts on how we get on soon. Right short and sweet today, but ovens are on, and some recipes with an autumnal feel will be up this week. Bold title I know, but really who doesn’t love cake? You know when it’s been one of those weeks? Well it has for me, preparation for mini me starting school, and getting care plans in place takes a lot of work ( and phone calls), so imagine my surprise when a parcel from We Love Cake arrived on the doorstep. It helped break the week up, although I have been swimming a couple of extra times to counteract the cake. This fab little bundle co-insides with the new launch of the Brownies and Bakewell Tarts in to Iceland stores across the country. 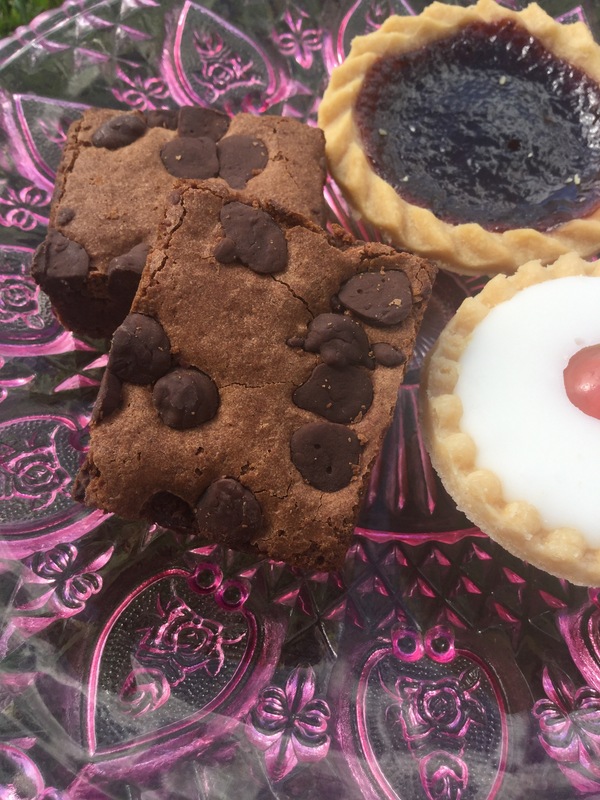 Something else to point out is that they are all gluten, wheat and dairy free, there is obviously almonds in the bakewell so no go for nut allergies. Don’t worry, I’m not cruel, mini me was at school introduction when the photos and tastings were going on. 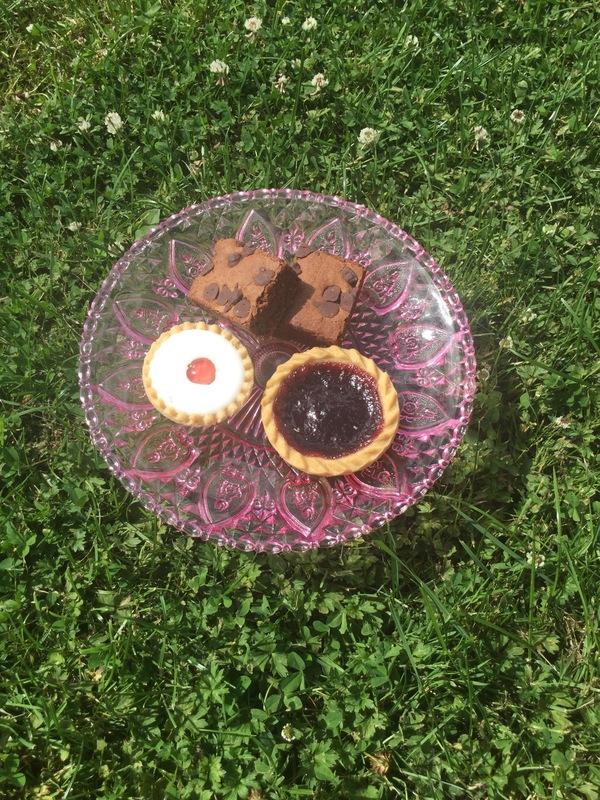 The tarts are delicious, lovely crispy pastry ( mine is mostly always a disaster), with a generous amount of jam. The apricot was my favourite- the jam has a sweet but tart flavour that bursts on your tastebuds. All the jams don’t taste artificial, and helpfully don’t set your teeth on edge from too much sugar either. So thumbs up for these. Blackcurrant and strawberry were the other 2 flavours. Now before the mutters of “Not another Brownie” start, hear me out. I liked these. I loved the fact they are packaged in twos- great for lunch boxes or picnics. They have large chocolate chips and a soft squidgy centre with a good chocolate hit. Considering they are dairy free as well you would never know, which I did wonder about, as I’m guilty of adding butter to my brownies. Now I’ve never been a huge Bakewell fan, it’s not something we have often mostly due to containing almonds, but these are new and I like to try different things. 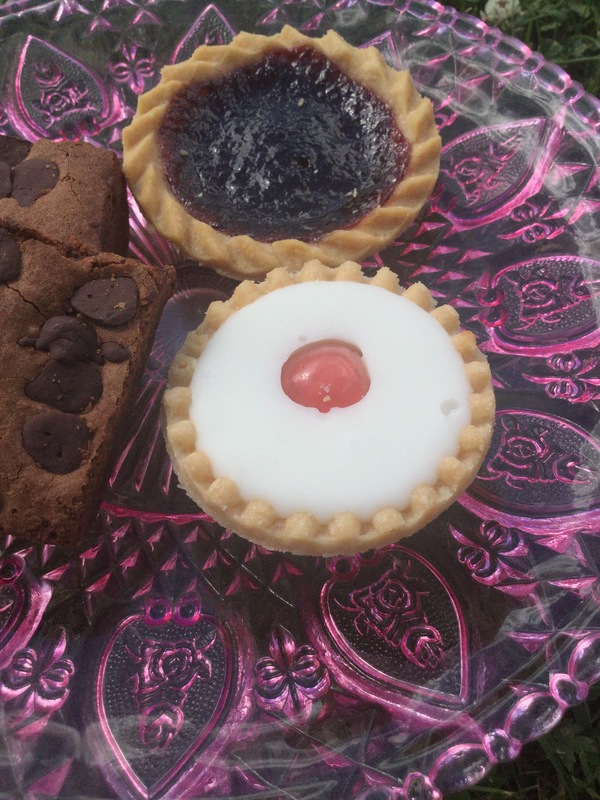 The problem I have with bakewell is the icing- it’s often so sweet and sickly, which puts me off. These have the same crisp pastry ( hooray) and a good portion of jam ( great, as some as so stingy on the jam). I didn’t like the cherry, but I hate glacé cherries so nothing new there, but and here is the BIG BUT the icing did not offend me. It’s sweet, but not sickly and doesn’t overpower the almond taste of the pie. Of all Bakewell tarts I’ve tasted this is the winner in my book. So there you have it, I enjoyed these cakes. Keep a look out in an Iceland near you. Round of applause fir We Love Cake. 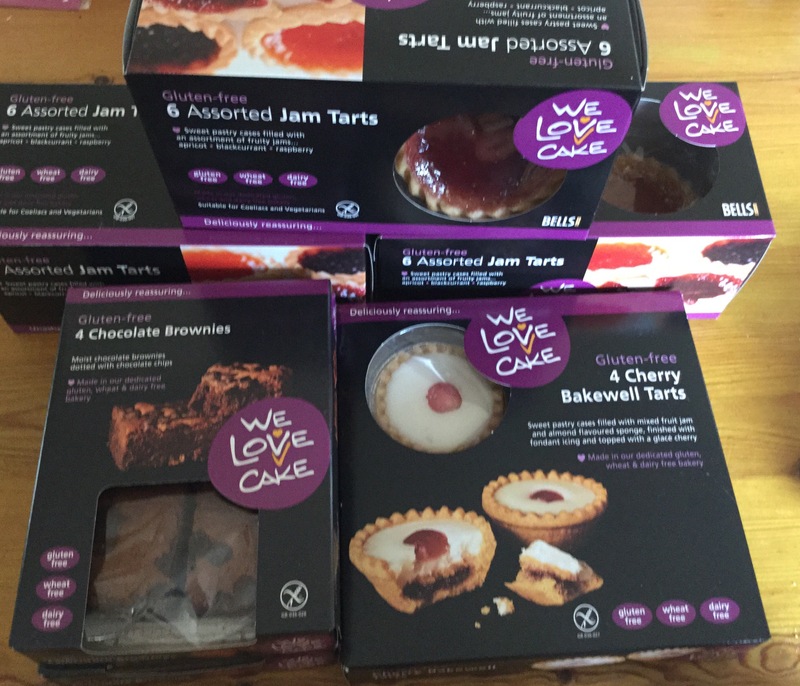 Have you tried these, or any more of the We Love Cake range? Let me know your favourites in the comments below. Disclaimer: I was sent these products to try- all opinions are my own and honest ( promise). What is this I hear you ask? Well I was intrigued to, and therefore very excited when the lovelies at Barleycup offered me some to try out. With Barley in the name I was a little skeptical to whether it was gluten free, but guess what ( and rejoice ) it is. In fact this is what Barley Cup say on their website about the products. Barleycup is a delicious range of instant gluten-free drinks made from roasted cereals and chicory root. 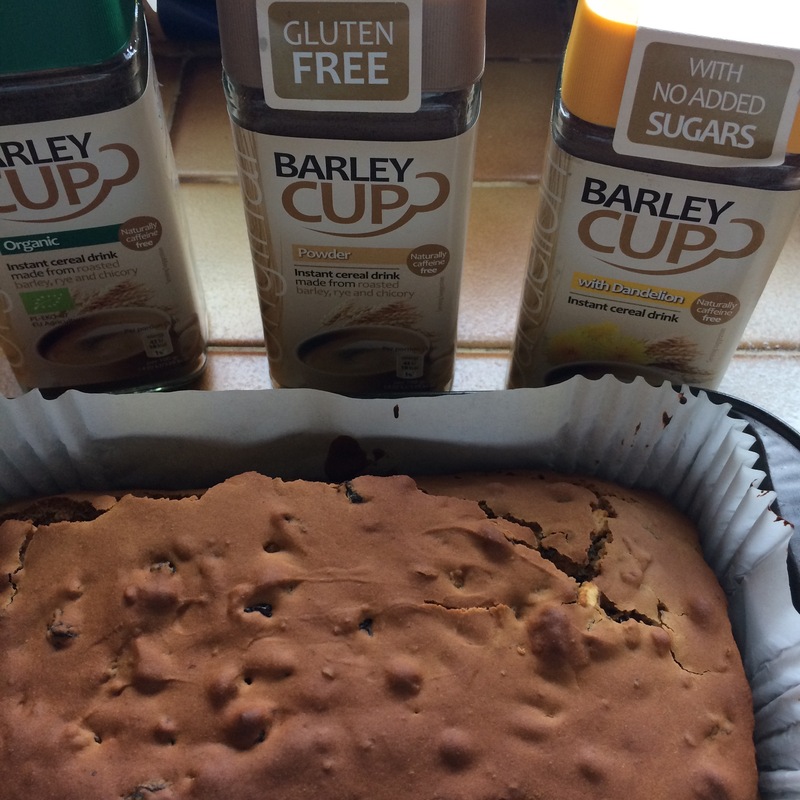 All Barleycup beverages are gluten-free and have been certified by Coeliac UK. A special process is used to separate the gluten and the products are regularly tested by an accredited laboratory to ensure that the gluten levels do not exceed 10mg/kg**. To start off I thought I’d try It as a drink, 2 teaspoons of Barleycup mixed with just off boiling water, and I added a splash of milk. The verdict is I liked it, the organic and original both taste like a very mild coffee, but without the caffeine. Probably my favourite was the barley cup with dandelion. There is the extra, slightly sweeter flavour that adds to the drink as a whole. Incidently all versions work wonderfully as a latte, and the even bigger news was that the product has not aggravated my coeliac disease what do ever. I’ve also been experimenting with recipes using Barleycup. 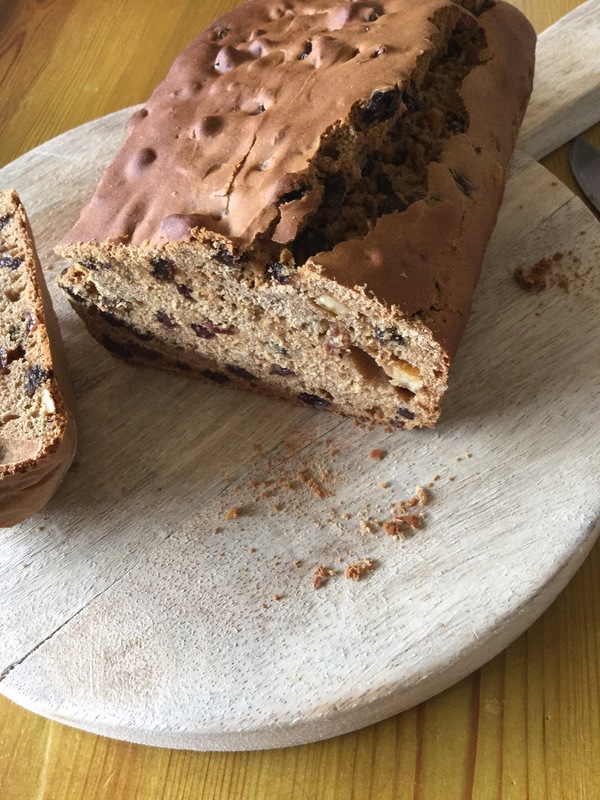 Below is my first attempt at a ( sort of) gluten free, nut free and dairy free malt loaf. Now it’s been years since I’ve had soreen, I can’t really remember the taste but I do remember the ‘squidge’. I’ve got to play one more time to go for the squidge factor but the taste is amazing ( sorry slight blow of own trumpet ). I promise as soon as its perfected the recipe will be up on this post. Other ideas I’ve had are mocha type smoothie and chia seed pudding. I’ll keep you posted on how they go. So would I recommend Barleycup? You bet I would, it’s a gluten free, caffeine free drink that tastes delicious and is proving to be versatile in its uses as well. Thumbs up all round. Disclaimer: Barleycup sent me these products to try, all thoughts and ideas are entirely my own. Hello to you all. As the title says what a week we are having. To start it all off, my mum had a freak accident which resulted in emergency surgery and now what appears to be a fairly long recovery period. After a few days in hospital, she is now home and predicting we’ll have a lovely summer as she’ll be in a sling for a while. I also think I couldn’t write a post and not mention the awful events in Manchester last week. A truly horrific attack has left many in shock and sadness ( me included). I think in times like this you actually need to look for the kind acts of people, that seem to cement everything together. The emergency services were amazing, as to the brave actions of the two homeless men near the arena that went in to help. Closer to home a little girl has been selling her toys to raise money for the Manchester victims. This moved me so much, believe me there are good people out there. On a happier note, everything is growing well in the gardens but I have been faced with this, this is my speckled lady, and she has been read the riot act. I guess I’ll ( sort of) forgive her, as slugs are her treat of choice. Also the elderflowers are starting to blossom, and I really want to try to make elderflower champagne, my first attempt ended in a broken light bulb where the bottle cork exploded. So where does that leave me? Well there just might be a give away over on my Facebook and Twitter pages this week to celebrate National BBQ Week ( yep it’s a thing). And some new recipes and a review should be up as well. Here’s to a great week everyone. 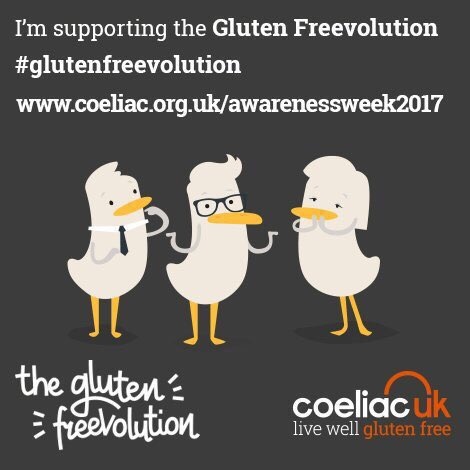 Well here we are again 8th-14th May is #CoeliacAwarenessWeek and this year Coeliac UK are asking you to join the Gluten Freevolution. But what does that mean?? Well aside from the usual scramble of companies launching new products and special offers in the free from field, the message is to help improve gluten free choices where ever you are. According to Coeliac UK 1 in every 100 people could have coeliac disease ( I’m one of them), and many more are choosing to incorporate gluten free into their diets and lifestyle. Which ever way you look at it, free from is a growing market. As a coeliac, higher demand means more products on shelves, which is great. I support this campaign, I personally feel eating out is still my problem area, staff in restaurants don’t fully understand allergies and if I’m to be glutened this is the week spot. Don’t get me wrong some places are great ( Pizza Hut springs to mind) but the issues of cross contamination and lack of staff training and understanding are usually the issues. As with the growing free from market, there too is a huge opening in the hospitality sector, they could attract ( and keep) new customers if a little more understanding and options were given to those with coeliac disease, and other food allergies for that matter. So let’s all get behind the campaign, no more are you to feel like you are being fussy. 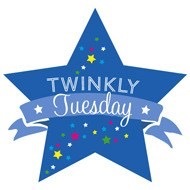 Let’s shout it from the roof tops – more allergy friendly establishments= happy customers all round. At the beginning of 2017 I set myself some goals. Amongst other things expanding my vegetable plot/ gardening skills were one of those goals. So how am I getting on I can hear you asking? I’ve fended off comments from friends and family that I won’t do it. For the record I’m now called Percy ( Thrower) my comeback is I’m too young to remember him- ha so there. I’m still shoe and fashion obsessed but I’ve added pretty wellies into the mix, and instead of heat magazine ( cause I no longer care about what Posh Spice is up to) I’ve been known to but Grow Your Own or Kitchen Garden magazines. Anyway I’ve digressed a tiny bit. This actually shows phase 2 of our vegetable growing. 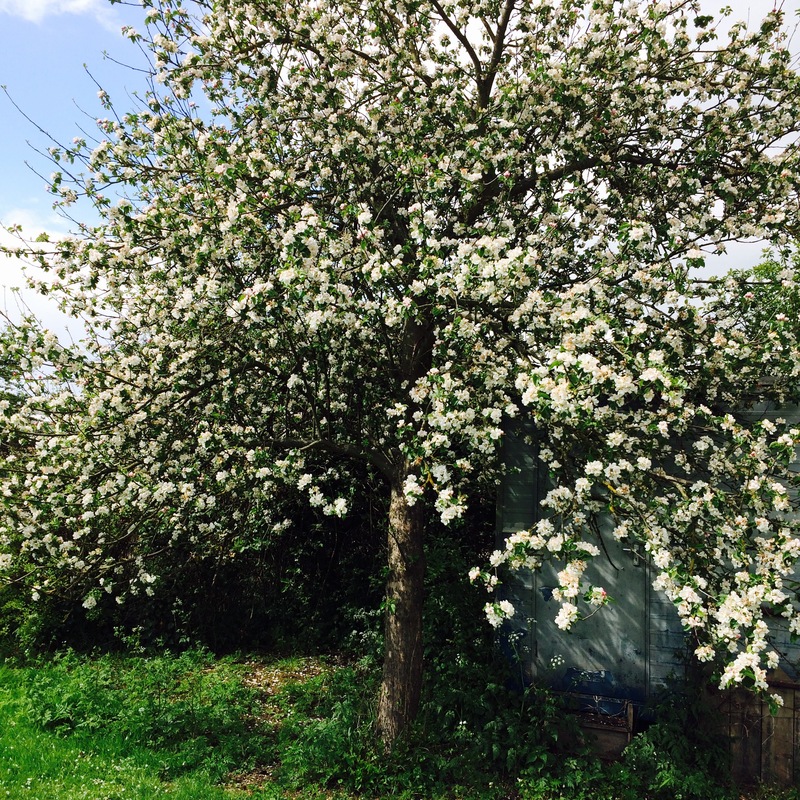 It’s taken 2 yrs to get to this point as this area was so so over grown when we moved in. 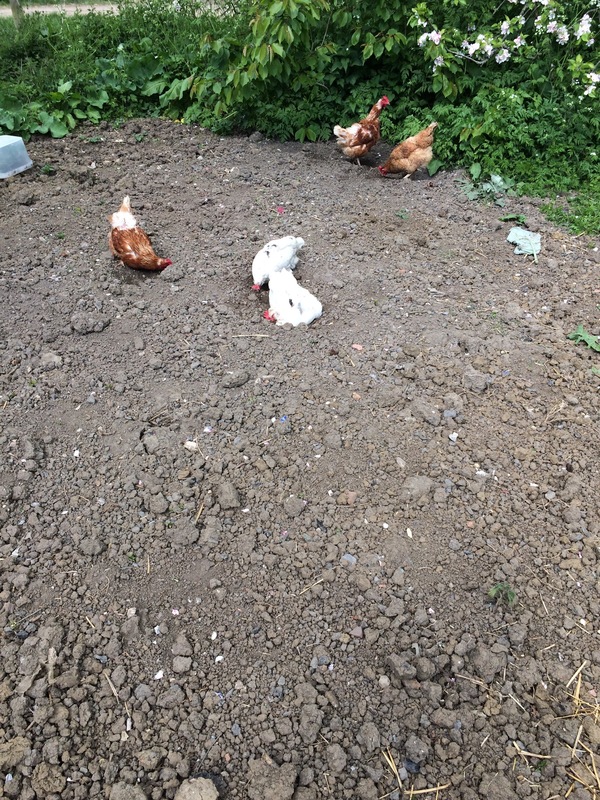 The soil is clay ( get me ) and we are working hard to improve the quality and texture of the ground. My compost bin is starting to work well, and I believe that mushroom compost over the autumn/ winter months may help. I’m still facing an ongoing weed problem, which I know I could use weed killer for, but we are trying to do without. 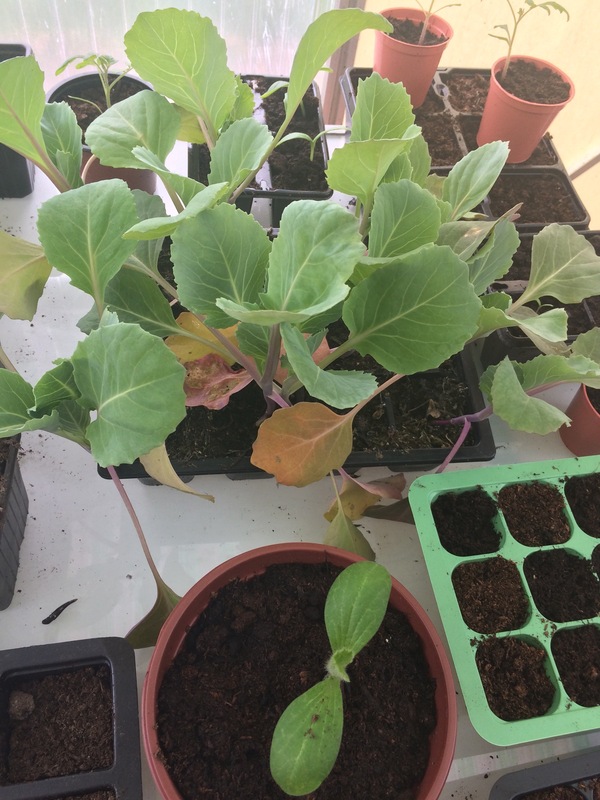 I cannot wait for the efforts of my labour to start paying off, I have so many recipies that I want to create with the home grown produce. You see what I’ve done there? In true free from foodie style, the home grown things are free from pesticides etc, and the recipes will be gluten, nut, dairy free as per usual. I thought you guys might like to see other aspects of my life ( possibly?) . So I’m hoping to incororate regular posts of how I’m getting on, with my mini side kick obviously. Gardening with a three yr old does add another great dimension to the mix, but hey that’s all part of the fun of it. Any grow your own tips? Or pictures? Let me know in the comments below.